Birthplace and guardian of Italian art and culture, Tuscany is one of the pearls of this beautiful European country, as well as a symbol of the Renaissance all over the world. Varied landscapes, cuisine that has no equal, a young spirit and kind-hearted locals... what's not to love about Tuscany? The home of the Renaissance and the birthplace of the Italian language, Tuscany has always excelled in terms of literature and the arts. Even today, its cities abound with cultural fervour and are home to some of the most prestigious universities in Italy. Combined with its bustling, intellectual cities are rolling rural landscapes - packed with fields of sunflowers and vineyards. Take your time here to savour slow-cooked food or stroll through medieval streets to renaissance-filled galleries for a real taste of la dolce vita. From its fields of sunflowers to its endless hills covered with vineyards, Tuscany is defined by its landscapes. Rolling hills are interspersed by Tuscan farms, which are often adjoined by restaurants serving up fresh produce from the farm's animals and fields. Whilst her countryside is truly spectacular and deserves to be explored in depth, Tuscany would be little without her cities. Capital in everything, including culture, Florence exudes elegance from the banks of the River Arno, adorned by the Ponte Vecchio and dominated by the dome of the cathedral, a masterpiece by Brunelleschi. Its museums, such as the Uffizi Gallery, are amongst the finest in the world and draw art afficionados year-round to marvel at their works. 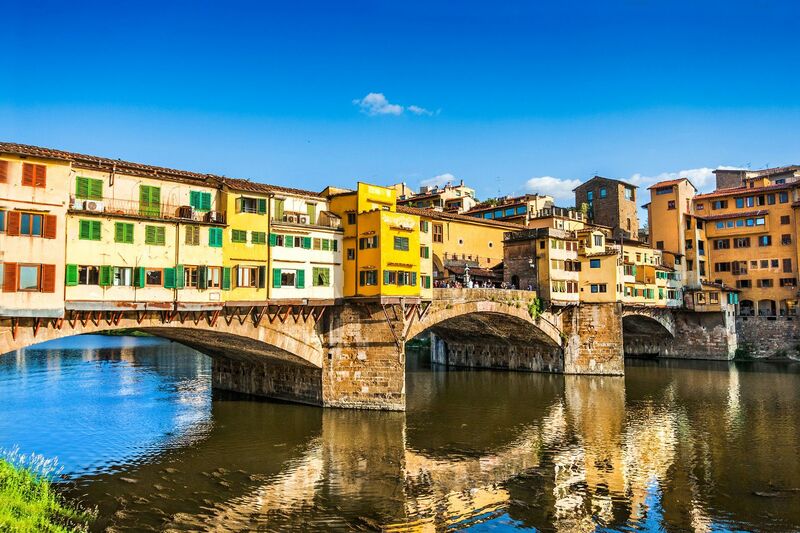 Away from the capital, Tuscan cities have just as much pulling power, from the splendid Piazza della Signoria in Pisa, and its famous Leaning Tower, Siena, Arezzo and Lucca. Where Pisa and its leaning tower are never short of visitors, but the region is home to several other pearls which all deserve a visit. Siena enchants visitors with its emblematic Piazza del Campo. Twice a year, in honour of the Palio di Siena, the region's most famous horse race, the square is lit up with the contrasting colours of the city's various districts. Arezzo, with its archaeological museum and the churches of the frescoes of Piero della Francesca and Cimabue, is a haven for Roman art lovers. Lucca, nicknamed the town of a hundred churches, is an example of a perfect blend of sixteenth-century architecture and a medieval town centre. Finally, although smaller, the medieval towns of San Gimignano and Volterra are also worth a visit. Armed with this architectural diversity, landscape and gastronomic excellency, this region of central Italy is able to attract a diverse audience. There are plenty of opportunities for those looking for a little R&R in peaceful surroundings thanks to a growing structure of Bed and Breakfasts. Whether you're looking for a coastal setting, green-hilled surroundings or a city centre to explore, this network of local B&Bs offers good prices and true Tuscan hospitality. The beaches on the island of Elba and Giglio are the equal of Sardinian or Apulian shores, with crystalline water and white sand. For a particularly rejuvenating break, combine coast with spas, of which there are many in the area around Siena, Montepulciano and San Casciano and which offer the expertise of many years and local products. Tuscany is a large, expansive region, and thus requires a fairly substantial holiday budget. In order to really make the most of everything on offer, it is best to avoid visiting (particularly Florence) in summer, as there are just too many people. It is all a matter of taste, but we have a certain soft spot for the area in autumn. The natural light during this period is perfect for photography enthusiasts. Tuscany is a region with many traditions, customs, beliefs and superstitions, differing from area to area. We find for example different types of races, among them the famous Palio di Siena, the famous horse race of medieval origin in which several riders on horseback, representing the city contrade, compete within a narrow ring in the Piazza del Campo. Another great tradition is Florentine Football, considered by many the forerunner of the modern game, although in the rules and fundamentals it is closer to rugby. Harsh and violent, Florentine football is played every year during Carnival and is played on a rectangular field by two teams of twenty men. Once the game starts, the two teams try (by any means!) to bring the ball to the opponent's half and deposit it in the net to score a "caccia" (a goal). One of the most famous and best known of Tuscan traditions is kept alive by cowherders, the Italian equivalent of cowboys. Their name comes from the Latin boum ductor, ie conductor of oxen, and they are almost considered to be local heroes, leading their herds amidst the wild and sublime nature of the Maremma. These old herdsman now no longer represent a real profession and have almost disappeared, but many associations try to keep the tradition alive. A culinary tradition which has been handed down since the time when Florence was governed by the Medici family, Florentine steak is a typical Tuscan dish. Only the best cut of the meat of a young Chianina or Maremmana cattle is used to make it. This typical T-bone steak with a thickness of at least two inches is grilled, without seasoning, on hot embers of wood coal. Well-cooked on the outside, red and juicy on the inside, the secret lies in the tender cut. Allegedly cacciuco used to be made by fishermen using the fish they hadn't managed to sell during the working day. Livorno-style cacciucco is a peasant dish, prepared with different types of molluscs and shellfish. Cuttlefish, octopus, rockfish, slipper lobsters, mussels and various kinds of firm-fleshed fish are all cooked together in a tomato and stock-based sauce. Once ready, it is served with Tuscan garlic bread. Commonly called cantucci or cantuccini, Prato Biscuits are prepared using the same recipe that Antonio Mattei perfected almost a century and a half ago. The dough is a mixture of flour, sugar, eggs, almonds and pine nuts and has no fats like oil or butter added, hence the hard texture of the biscuits. In Prato, the ancient Antonio Mattei biscuit factory is still open with its original brand name, and continues to produce quality products. Find weekly weather forecasts for Tuscany . Different criteria make it possible to predict with precision the best time of year to go to Tuscany . A comprehensive weather score, made up of temperature indicators, bad weather predictions, sunshine levels and wind speeds, will allow you to choose the activities best suited to the weather conditions and therefore make the most of your holiday in Tuscany . Florence is known for the production of objects in skin and scalp, and the many businesses that characterize the city. There's sure to be found in small shops streets where to buy wallets, purses and handmade objects, as well as Carterie antique and specialty shops in the realization of decorative elements. You can not leave away from Tuscany without being brought home some typical gastronomic specialties! A bottle of tasty olive oil, the good Chianti or its characteristic bread without salt. If, however, you are more craft lovers, in Tuscany you will find many artifacts and pottery, as well as semi-precious stones, such as marble, skillfully worked.